Funk-rock-fusion legends Brand X are well-known for their dynamic and energetic live shows. Anyone who has seen them at in the past has a story or two to tell. In some circles, they may be best known for being "Phil Collins' other band besides Genesis." For many musicians, and those who simply know the music, there is no one quite like Brand X. 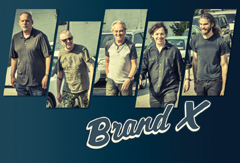 Founding members John Goodsall (guitars) and Percy Jones (bass) keep the Brand X tradition alive with a band that many are claiming as the best live Brand X ever. Members of Yes, Dream Theater, Kansas, The Dixie Dregs, Metallica and many others have come out of the woodwork to see Brand X live -- and rave about their live show. From some serious fusion chops to subtle world beat dynamics, to offbeat British humor, it's all in an evening with Brand X.